Before airplanes, it took mail carriers on horseback months to transport letters across the country. Before washing machines, it took a full day of physical exercise to wash and dry a family’s laundry. And before cranes, it took decades—sometimes centuries—to build large structures such as castles and cathedrals. The point being: Whatever you do, technology probably gives you a better way to do it. That’s the prevailing wisdom at architecture firm Perkins+Will. While many design practices cling to old ways of working, Perkins+Will perpetually mines technology for innovations to make architecture easier, faster, and better. “Our mantra is, ‘Why and how?’” says Nick Cameron, director of digital practice at Perkins+Will. As in: Why are we doing things this way? And: How can we do things better? Those questions have driven Perkins+Will to test and adopt many next-generation technologies for architects during its 82-year history, the latest of which are big data; virtual, mixed, and augmented reality; and generative and computational design. Learning from its experiments can help your firm take advantage of emerging opportunities and sweeten old practices with new thinking. At any one time, Perkins+Will is managing more than 700 active projects, each of which can be mined for information to help architects work more effectively and efficiently. 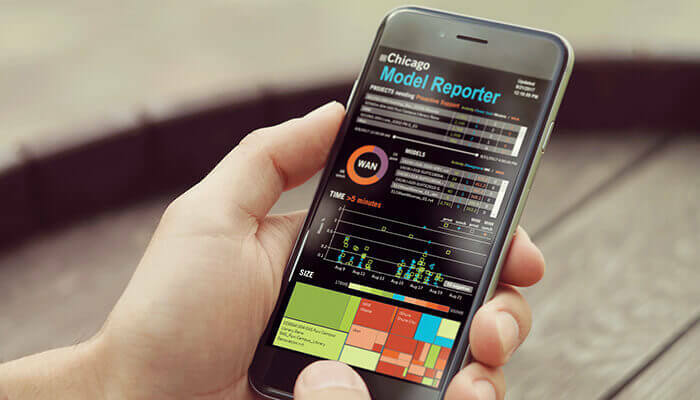 Perkins+Will created an app that combs Revit models for designated metrics that can indicate teams in distress. Courtesy Perkins+Will. Perkins+Will created an app that automatically combs Revit models for designated metrics—such as large file sizes, long synchronization times, and large numbers of simultaneous users—which can indicate teams in distress. Using a visual dashboard, managers can see in real time which projects need extra attention. See how Perkins+Will harvests and stores its project data. You can: Perkins+Will built a “social-VR” solution based on multiplayer online games. 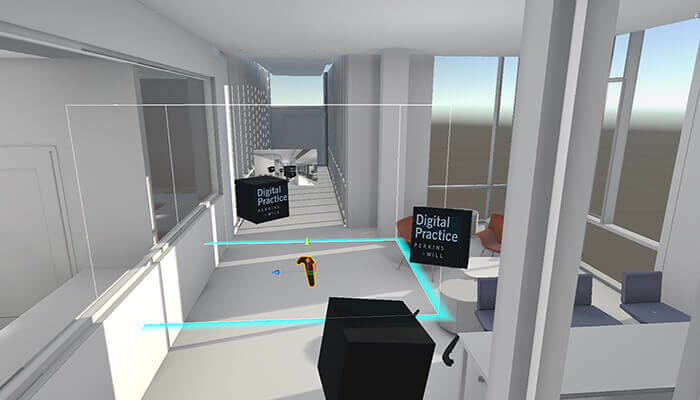 To unite teams inside virtual workspaces, firms can replicate their workflow: Export a BIM model from Revit into a rendering solution such as 3ds Max, and then into a VR development platform such as Unity. Finally, use a multiplayer gaming plug-in such as photon VR to “network” your VR experience so it can be cloud-accessed by multiple users. Perkins+Will developed a “social-VR” project model based on multiplayer online games. Courtesy Perkins+Will. VR is surprisingly simple to incorporate early on in most projects, adds Fei Xie, a designer at Perkins+Will’s Boston architecture studio. “The reason is, the renderings do not take additional time to prepare the VR. Designers who don’t have experience with it think, ‘Oh, VR is something too fancy. Maybe we don’t need that.’” But, Xie explains, scientists have a different perspective: “They would say, “Okay, if we have the model, we can just enter the code rendering. We will get the VR.’ It’s provided by the experience.” Watch Perkins+Will demonstrate how to set up social VR using Revit, 3ds Max, Unity, and photon VR. 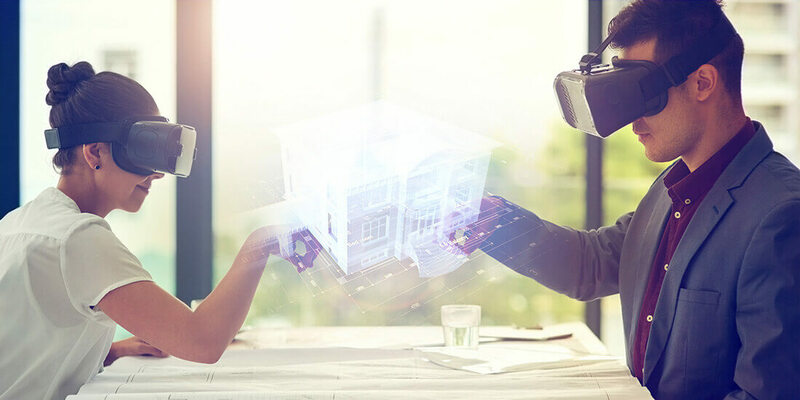 While VR is a great way to explore a space that hasn’t yet been built, mixed reality (MR) is an ideal technology for architects to explore a space that already exists. “Mixed reality is literally mixing interactive virtual objects onto a physical area,” says Michael Shyu, an architect in Perkins+Will’s Boston office. In the past, he says, architects would visit jobsites with rolls of drawings, then attempt to reconcile them with the physical space. With MR, architects can ditch the drawings for a headset such as the Microsoft HoloLens to see a 3D model superimposed on the actual space. Boost productivity at your architecture firm by investing in the right technology for the job. 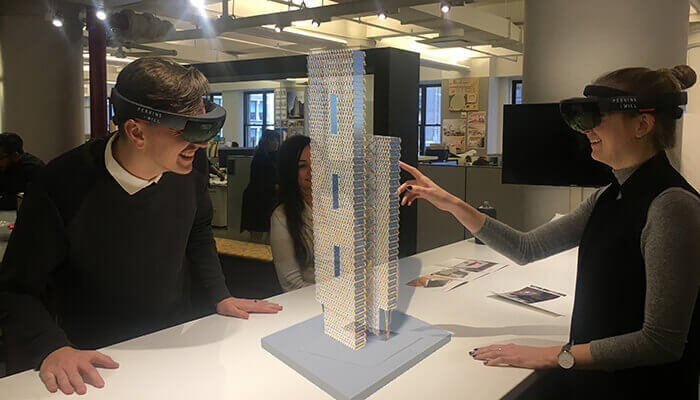 To test MR’s potential, Perkins+Will created several BIM models for an empty space above its Boston office, which it imported to HoloLens from Revit using a video-game optimization strategy, like its social-VR team. The end product was an MR app that offered users an immersive tour of the empty space. Shyu says firms that experiment with HoloLens today will enjoy a competitive advantage tomorrow. “MR is going to be the future,” he says. Read Perkins+Will’s presentation and handout material about creating an MR experience. Perkins+Will’s mixed-reality app provides immersive tours of spaces. Courtesy Perkins+Will. To achieve the same effect with exteriors that MR facilitates with interiors, consider augmented reality (AR), which uses mobile devices instead of headsets to superimpose virtual objects on physical spaces. To leverage AR, use developer kits such as Apple’s ARKit and Android’s ARCore to easily exploit smartphones’ AR capabilities. “What’s great about [AR] is it can be readily deployed through a ubiquitous device,” Shyu says. Read Perkins+Will’s presentation and handout material about using AR in collaborative design. Technology isn’t just giving architects new ways to experience designs; it’s also offering new ways to create them, according to Perkins+Will—which is also experimenting with generative design. Also known as computational design, generative design uses artificial intelligence to create computer-generated design options. Architects using machine learning algorithms define their design goals, parameters, and constraints; plug them into a computer that uses machine-learning algorithms to process them; then receive a menu of optimal design options for consideration. In 2016, Perkins+Will partnered with Autodesk—which recently unveiled a new Toronto office created using generative design—to develop Space Plan Generator (SPG), an experimental algorithm it used to design two floors of a hospital. Based on this experience, the firm has determined that generative design will be ideally suited to creating common spaces, like bathrooms. “To me, it’s a device for bringing computational design into all of our projects because every project has toilet rooms,” Cameron says. From VR, AR, and MR to big data and generative design, the ultimate promise of next-gen tech, Perkins+Will concludes: More and better design, not less.